Things is a delightful and easy to use task manager. It’s the perfect companion for everything you want to achieve in life, offering a great balance between ease of use and powerful features. When you start using Things, you’ll be surprised how easy it is to enter and manage your tasks. And with Things’ beautiful interface, task management becomes a delight. But all of this doesn’t come at the expense of power—everything you wish for in a task manager, Things has you covered. • Today: Decide which tasks you want to do today and put them into your Today list. Throughout the day, come back to this list to check items off. Things will automatically show you due and scheduled items there once their date arrives-- so you won’t miss anything important. • Focus: See what you need to do Today, what’s coming up Next, and what’s Scheduled for later. Put tasks in Someday if you can’t work on them right now, you can always come back to them later. • Keep organized: Work, Family, Hobby- with Things, everything has its place. Projects and Areas of Responsibility let you master complex tasks and stay on top of your responsibilities in life and work. • Use Tags to assign contexts, priorities, time – whatever fits your personal workflow. Quickly filter a list to find those tasks which are most relevant now. • Out of your head, into Things: Enter new ideas the moment they hit you. 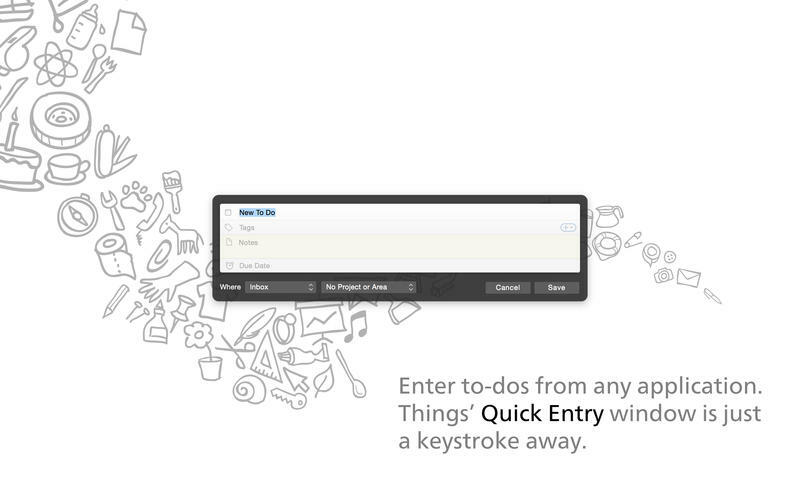 Things’ Quick Entry window lets you add new tasks without interrupting your work. And thanks to the amazing Autofill feature, the Quick Entry window can be automatically pre-filled with the currently selected text, along with a link to the email you are reading, the webpage you are currently viewing, or the document you are editing (works with most applications). • And much more: Create repeating tasks, add due dates, schedule tasks for a later date, import Reminders, review completed tasks in the Logbook, etc. Things also includes a Today Widget for Notification Center, Handoff support for seamless transition between Mac, iPad, iPhone, and Apple Watch, an “Add to Things” sharing extension for creating to-dos from other apps, and support for Split View and Force Touch Trackpad. Your to-dos, on all your devices. 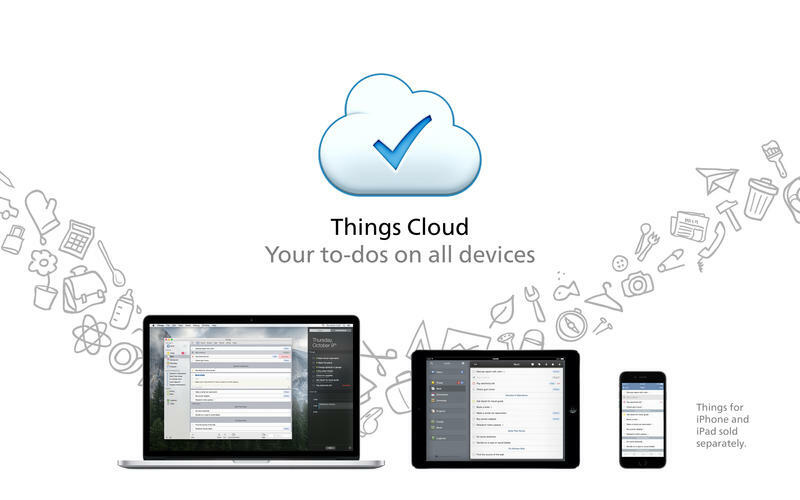 Things Cloud is a free service that stores your to-dos and updates them quickly & effortlessly across your Mac, iPad, iPhone, and Apple Watch (apps sold separately). • Improved stability and bug fixes.